It’s becoming harder and harder to think of new ways to declare your love (or not) during Valentine’s Day. Soaking in a red wine-filled tub or naming a cockroach that will be fed to a meerkat after your ex are some of the Valentine’s Day options. Cute and furry baby animals are fan favorites and the team at JW Marriott El Convento Cusco in Peru is ready to deliver. 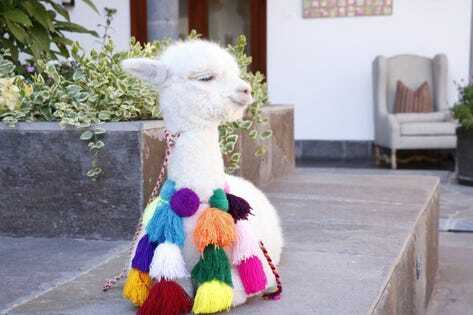 On February 14, out your best face forward as the hotel will deliver alpaca-grams via FaceTime starring the hotel’s resident baby alpaca, Panchita – a sweet, cuddly camelid who visits the hotel daily with her human for selfie opps with guests, according to JW Marriott Cusco. You don’t need to be in Peru or a guest of the hotel to participate. To request an alpaca-gram, head to www.lovepanchita.com and fill out the request form. In the comments section, add everything from the name of your loved one to receive the sweet greeting, whether it’s a significant other, your best friend or family member, their relationship to you, the number to reach them (calls are only available via FaceTime to telephone numbers in the United States), and a personalized message. At first I was thinking this would be an adorable idea for children but recipients must be 18 years of age or older. Maybe next year Panchita can expand her age range. Then again, I’m not sure my kids’ teachers would be happy that Panchita is calling them during class, no matter how cute and cuddly she looks. Surprisingly, this opportunity is free (although I’m told that standard calling rates apply). Best to hurry as all requests, which are being delivered in a random order, as they need to be submitted no later than 5pm PST tomorrow, February 12, 2019. Valentine’s Day is one of those “holidays” which I feel causes more issues in relationships since one person tends to either love or hate and is annoyed their feeling isn’t mutual. So instead of either both celebrating it (or not), people get into arguments. It’s also one of the easiest “holidays” to get right. If someone wants to be recognized, is there any better or unique way to say “I Love You” than an alpaca-gram? So make this year the year you decide to send the gift of furry cuteness with a love gram from a baby alpaca. Thank you, Panchita and JW Marriott Cusco in Peru for making the love connection.